Jackie Brown is Quentin Tarantino’s most underrated and unique film because his usual thematic fixations, motifs and techniques are fascinatingly repurposed. For example, his usual exploration of the self-constructed persona is used as a subtle change in attitude for the central character. 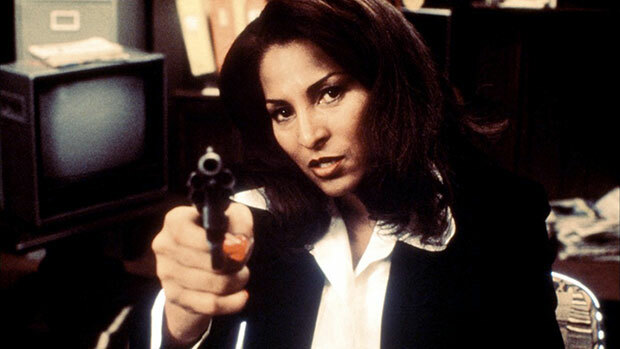 Jackie Brown (Pam Grier) changes her behaviour and emotional state based on who she is dealing with. She has to sound convincing in her planning and reasoning. The rational for this is because she is trying to get half a million dollars whilst the cops and many others are watching her every move. Grier plays the title character with a great casualness, vulnerability and a constant sense of meticulously inner thinking. The best example of this theme having a singular purpose is when Jackie is waiting in the dark for Ordell Robbie. (Samuel L. Jackson) The small scene shows Jackie affecting different stances, facial expressions and vocal tones for the purpose of engaging Ordell. Additionally, Jackie Brown feels like a film that is not trying to subvert or present schlocky genre fare in an interesting new way. The primary reason for this is because the picture is an adaptation of the Elmore Leonard’s 1992 novel, Rum Punch. The consequence of this yields some great sequences that are intrinsic to the story as opposed to illustrating extensive film knowledge. The best example is a simple scene where Jackie is leaving the money in a major retailer dressing room. The audience is initially shocked at this scene, but then Tarantino presents the same scene from other character’s points of views. The result is a great subversion of the expectation of the narrative as opposed to genre conventions. Coupled with Tarantino’s best use of music and a rare feeling of melancholy and Jackie Brown may be Quentin Tarintino’s finest film.